Sadly joint problems are prevalent in women, especially among those approaching their menopausal years and after. Depending on the severity of the condition, some women prefer to seek relief using a natural remedy, rather than opting for prescribed medication or therapies. Fortunately, there are many options that can be worth exploring, which many women have found to be successful as a remedy for stiff joints. Read on to discover more about five of the most popular. Omega 3 is well known for its ability to enhance supple bones and flexibility. It has long been used for this application, and studies have confirmed that it is extremely effective as an anti-inflammatory agent. While it is possible to find omega-3 supplements, it is widely accepted that the best sources of this compound are in fresh, oily fish such as mackerel. Advocates of natural medicine have recommended the use of chilies for pain relief for many centuries. The capsicum substance within the plant works by inhibiting the pain receptors in the nerves, thereby reducing the sensation of pain and aching. Many women find that capsicum gel is especially helpful as a remedy for aching joints, as it works quickly and in a specified area as required. The eucalyptus plant contains compounds which contain anti-inflammatory and analgesic activity, making it another suitable choice when considering natural remedies for joint pain. One of the most popular applications of this plant is in the form of vaporub; often used for relieving colds and flu, this topical treatment is also adept at relieving tender joints and aching muscles. Ayurvedic and traditional Chinese medicine both largely value turmeric for its uses as an anti-inflammatory. Scientific research has suggested that the herb contains properties which can be useful for the remedy of joint pain, relieving swelling, tenderness, and stiffness. Topical treatments such as turmeric lotion can be beneficial for localized areas, or for general joint pain the dried root powder is recommended for oral consumption. Recent investigation has revealed that green tea might be a worthwhile natural remedy for joint pain and stiffness. A compound found in the solution is capable of inhibiting the process of inflammation and damage of joints. Green tea is particularly enjoyed in China, where many people drink multiple cups every day. For those who do not enjoy the taste, there are a number of alternative supplements available. This tree resin from the Boswellia species has been proven to be effective as one of the many joint pain remedies. It possesses anti-inflammatory, anti-arthritic, and analgesic activity, making it hugely advantageous in treated all of the symptoms associated with joint pain. Natural frankincense oil can be applied topically, or capsules should be taken daily. 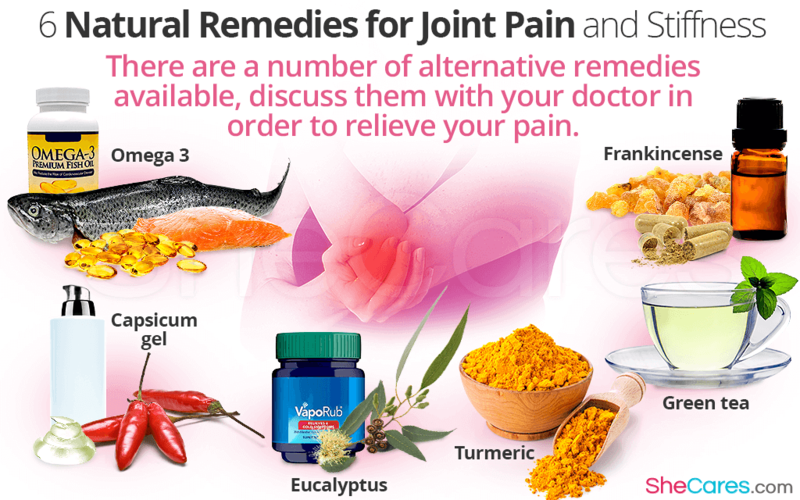 Many women who suffer with joint pain favor the idea of finding a natural remedy for their condition, as these are usually inexpensive and tend to have fewer side effects than prescribed drugs. If you are not sure which option is best for your condition, it is recommended that you discuss your circumstances with your doctor in order to gain advice.